From 9 to 11 October 2019, SABA AUTOMATION participates in the 26th edition of the MIAC. Visiting the MIAC means getting a 360-degree view on the technologies and equipment of the paper industry, from Paper and Cardboard Production to Tissue Card Transformation. 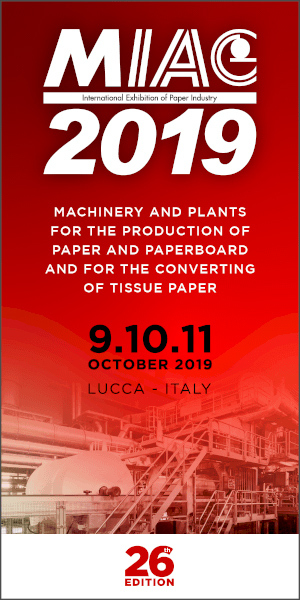 All this thanks to the constant participation of the leading companies in the sector that showcase the latest innovations in their production: machines, plants and state-of-the-art solutions to better manage the various phases of the production cycle and the transformation of paper and cardboard. On this occasion SABA AUTOMATION will show its dedicated end-of-line solutions (palletizing, handling, conveyors, pallet packaging, etc.) in the Tissue industry. SABA Automation supplies end-of-line solutions. By using our technology, you can handle production, reduce costs and improve management of logistics.